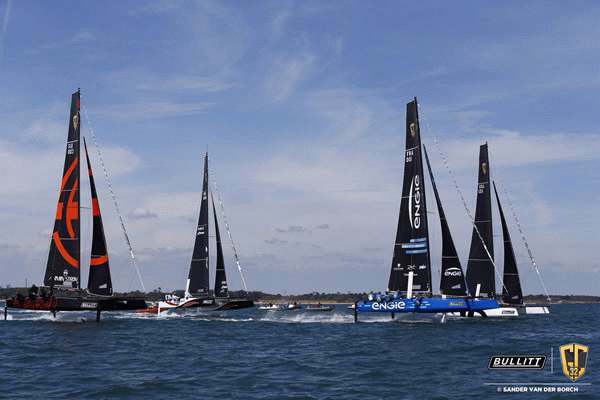 Cowes and the Solent turned on their maximum appeal for the opening day of the Bullitt GC32 Racing Tour’s Cowes Cup with brilliant sunshine and eventually enough wind to get the GC32 catamarans fully foiling. With the course set up in the Western Solent to the north of Newtown Creek, the day proved initially tricky; the south-southwesterly wind light and in the same direction as the flood tide. This made the upwind legs challenging even for the speedy state of the art catamarans. It was quickly apparent that playing the mainland shore was necessary to steer clear of the tide that at times reached three knots. As the day wore on, the sea breeze built to 12-13 knots, allowing the GC32s to fully foil on the downwind legs, at times hitting speed of 24 knots. Surprisingly given the boats are still so new to their crews, the racing was competitive and after five races, four of the five teams had each won a race. At the close of play, after six races, both Sultanate of Oman and ARMIN STROM Sailing Team had won two races, however it was the ever consistent Alinghi, with Team Principal Ernesto Bertarelli at helm, that was leading overall. But it is close with ARMIN STROM just a point behind chased by Sultanate of Oman and ENGIE a further two points back. Racing tomorrow starts at 1100 BST (1000 UTC) with a further six races scheduled. Friday is the last day of inshore racing before the five GC32s compete in the JPMorgan Asset Management Round the Island Race on Saturday.